Here are Allan Hodgdon and Calvin Colby, newly elected Essex County assistant judges, taking their oaths of office at 8:15 am on Monday, February 2. The oath is administered by Valerie Foy, court security officer. Allen Hodgdon is the Town’s unofficial architectural historian. He also serves as the probate judge, presiding up in Island Pond. He used to run the Guildhall General Store, where you could get a great sandwich, cup of soup, cinnamon bun or piece of apple pie. Calvin Colby lives in neighboring Lunenburg, Vermont. Both were born and have lived almost their entire lives in Essex County. In Vermont, assistant judges are elected. They administer the county court systems, as well as sit on the bench on either side of the presiding judge in civil matters. They have the power to influence factual findings, although conclusions of law are reserved for judges trained as lawyers. Some assistant judges, if they complete certain training requirements, can preside on their own in traffic court and undisputed divorce cases. The role of assistant judges in Vermont remains controversial: some argue that the positions should be eliminated and that all judges of any stripe should be lawyers. Others believe that the assistant or “side” judges are critical to the local administration of justice, because they are uniquely attuned to their communities and can provide much-needed perspective to the presiding judge, who typically rotates out of the county after just one, or at the most, two years. Despite ongoing disagreement about the role of assistant judges, I suspect they will be around, at least state-wide, for the foreseeable future. What I’m not so sure about is whether our court here in remote Essex County will survive at all. Yesterday’s Burlington Free Press featured an article about how the citizens of Grand Isle County (on the other side of Vermont) are battling to retain their county court system. The Vermont Legislature once again seeks to slash the State budget, and it looks like that may involve another attempt to close down courthouses in counties such as Grand Isle and Essex, the most remote and least populous (and poorest) regions of Vermont. We’ve been down this road before. In 2010, the Legislature passed a massive judicial restructuring bill. In the course of debate over that bill, Montpelier came quite close to shutting down our county court system entirely. In the end, a formal alliance between the Essex County Democrats and Republicans (who usually agree on nothing) prevented that from happening. The Court remained open, although all criminal proceedings were moved to neighboring Caledonia County. (Defendants and witnesses had to travel over to St Johnsbury). Then in May of 2014, the criminal docket moved back to us, largely due to the efforts of our local sheriff. Now, it’s anyone’s guess what will happen. 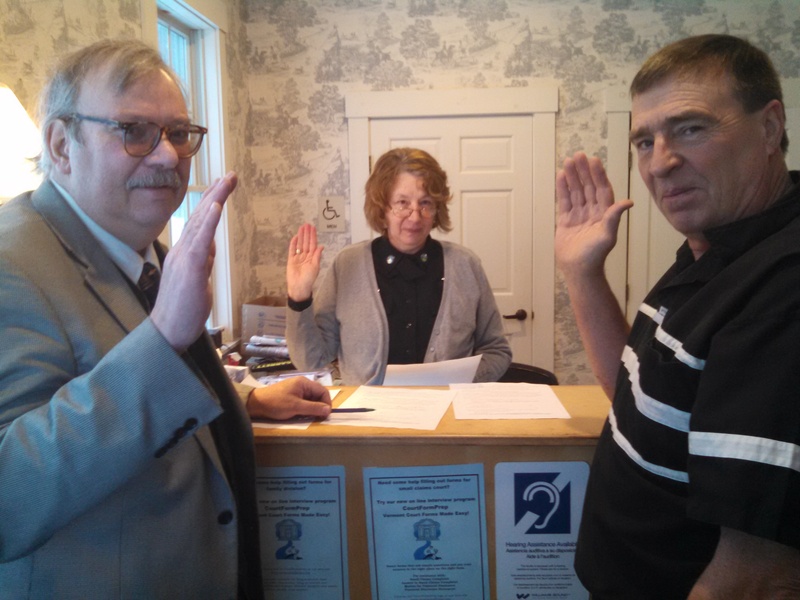 But in the meantime, the Honorable Allen Hodgdon and Calvin Colby got sworn in.